BAD FIRE SATURDAY NIGHT 10:40P.M. APRIL 14, 1894. 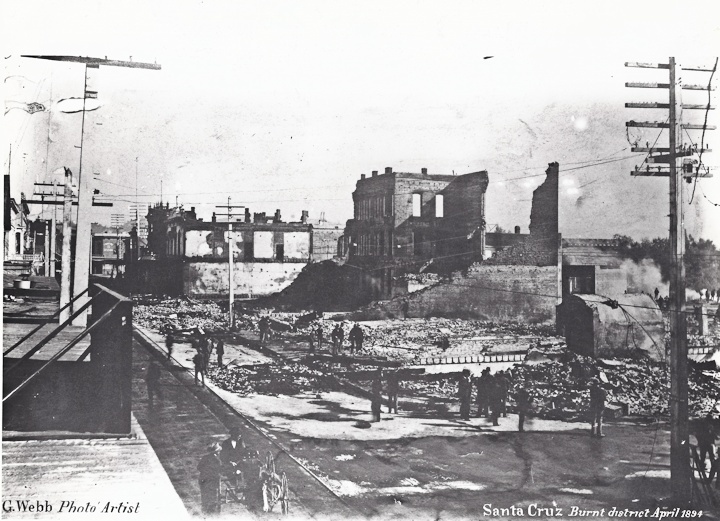 This is the block bounded by Cooper Street, Pacific Avenue and Front Street. There wasn’t any water pressure because the City Water mains had been turned off. All this according to Sheila O’Hare and Irene Barry’s Arcadia’s Images of America Series “Santa Cruz California”. (2002). (Photo Covello & Covello Historical Photo Collection). ART BITES BACK. Showing right now is one of the very finest art shows the Santa Cruz Art League has ever staged. The problem is that it’s only at the 526 Broadway League until this next Sunday March 18th. 12 local artists including Coeleen Kiebert, Robert Blitzer, Don Monkerud, t. Mike walker, Eike Waltz and especially Russell Brutsche show just how powerful art can and should be when the people get mad. You can’t go far without thinking of Goya and Picasso and their influence is echoed in many works here. 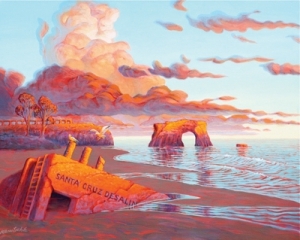 Seeing Rus Brutsche’ s At “The End of The Day” depiction of Santa Cruz after the failure of the now infamous De Salination Plant gives that contemporary battle against the plotting of our so called city fathers and mother’s new poignancy and hope. Another Brutsche painting rails against developers and money. Kiebert’s angry, cruel and tortured dogs and beasts remind us of another side of society. Walkers’ rant against tobacco, cosmetics, Coca Cola and the treatment of the homeless keep you totally involved. There are photos, collages, metal sculptures, ceramics, Joseph Cornell inspired boxes…it’s all there. Now if only our politicians would realize that artists are our representatives, our consciences, and that they are speaking in ways we can’t. There’s an artists forum/discussion Sunday March 18th 2-4pm. It’s free…that’s 526 Broadway, where the Lord’s Last Supper used to be, and that too is a statement. PLEASURE POINT BICYCLE LANE PROJECT. Backwards??? THE PEOPLE’S VOICE.With the De-Sal issue and so many more issues facing our city council, why doesn’t someone create a secure and trustworthy online voting system? We could vote at nearly no cost whatsoever every week if necessary or just in absolutely necessary cases like de-sal and let the council know where the people stand. We see over and over again where council members believe they are doing what we want…or more often, what they truly believe is best for us. The online voting doesn’t have to be legal or binding, just make the results public, immediately. Surveys, petitions, voting, tests, samples are being done all the time online nowadays, we should do that here…and now. AN ONLINE PETITION.Here’s a perfect example of online integrity. I signed this petition urging Jerry Brown to stop Clear cutting in the Sierra Nevada and elsewhere in California. I got this response Monday and am passing it on to you…”Can you please share the petition link below with your friends? If each of you gets only 5 friends to sign on, we can really grow this petition and send a strong message to Gov. Brown. And if enough people sign, SignOn.org or MoveOn.org may distribute it far and wide. Please share by e-mail, on Facebook, with Twitter, and in any way you can. Every signature counts! Thanks for standing up for California’s forests! SARAH PALIN ON HBO.Don’t miss Julienne Moore’s portrayal of Sarah and Ed Harris’ duplication of John McCain in HBO’s excellent 2 hour “Game Change”. It’s being shown several times all this week on HBO so go visit some friend who subscribes. It re-affirms what you already think about Sarah AND more importantly, it reveals still more about what and how our US politics are run….scary. MORE ABOUT HBO. If your friend does let you watch “Game Change” don’t ask if you can also watch the HBO series “Luck” starring Dustin Hoffman, Nick Nolte, Michael Gambon, and Dennis Farina. It’s almost all filmed at Santa Anita Racetrack and is about the seamy side of horse racing, and it’s really boring. Avoid HBO’s other series such as Eastbound & Down, Life’s Too Short, and Boardwalk Empire. 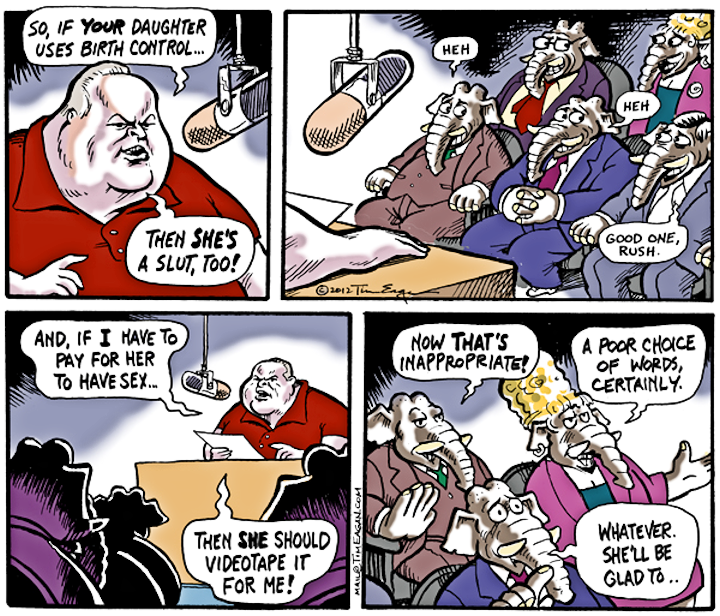 They are all ill-conceived. But Rent or borrow HBO series like Enlightened starring Laura Dern or No. 1 Ladies Detective Agency when you need to laugh. LINK TO BONNY DOON’S HIGHLANDER NEWSLETTER. Click here to read the latest issue of The Rural Bonny Doon Associations newsletter. It has great and brief articles that should bring all of us up to date on The Cemex Land Purchase, LAFCO and DE-SAL, the invasion of Monster Homes that’s happening all around us. It also tells where to watch the Amgen Tour in case you care about that sort of thing. PATTON’S PROGRAM. Gary’s on vacation and while he’s away he socks it to us with views on passion, Patagonia, Gauchos, How much Simitian is involved with High Speed rail (and how much Gary himself is involved with high speed rail…the cause). Then he tells us we need to get organized if we are going to be successful in fighting against the City Council’s and Bill Kocher’s De-sal plant. LIONS ATTACK CIRCUS TRAINER. According to You Tube results this apparently happens more than you want to think about. SUPPORT THE CUBA CARAVAN THAT BREAKS THE BLOCKADE! The Santa Cruz Cuba Caravan group invites the community to their monthly meeting and celebration. Hear Gail Walker, co-director of Pastors for Peace, on the upcoming blockade-busting Caravan to Cuba and what we can do to end the blockade and travel ban. More Americans are going to Cuba, under US government license, but travel to Cuba for most of us is still prohibited. Meanwhile the US government’s 51 years long economic blockade is as harsh as ever, and Cuba is undertaking a long term reorganization of its economy to enable its people to get by under this attack. Solidarity with Cuba is as important and needed as ever. They’ll be having a vegetarian dinner; and will present awards to local activists, Nancy Abbey and Lois Muhly. Guests will need to take off their shoes in the performance hall to protect the flooring. There will be live music by Flor de Cana; and it’s MC’d by Brett Taylor. It’s sponsored by: *Resource Center for Non-Violence, *Watsonville Autonomous Brown Berets, *Santa Cruz Cuba Caravan ,*Three Americas and the *Women’s International League for Peace and Freedom. It happens Friday, March 16th, 7-10 PM, Pacific Cultural Center, 1307 Seabright. Sliding scale: $15-25. Micaela writes..” I finished knitting my first wool slipper yesterday, one of a pair that will keep my feet warm when I run downstairs for tea during the winter. I’ll need to work quickly because autumn arrived in Antarctica this month. The wind has lost its milk teeth, and thick fog coats the harbor nearly every morning. It freezes onto our walkways in paper-thin sheets, later melted by a cold rain that invariably visits in the afternoons. But with this weather come the clouds — rolling sculptures of fluff to replace the gray film we typically see on summer days. We’re in that luminal zone between 24-hours sunlight and 24-hour darkness, so sunrises and sunsets go on for hours. Not everyone lives in a place where it starts to get dark after dinner and you think– how odd! Seasons govern our lives in the Antarctic in more practical ways, too. The next southbound ship brings the bulk of the winter crew and takes the summer crew back north, to the Real World– all except for me! Only two weeks from now, the familiar faces will be waving down at me from the deck of the ship as it pulls away from the pier, and I’ll stay on for the winter with a new set of people. Most of the summer crew thinks I’m crazy, and maybe on that day I’ll agree with them. Right now, I feel excited about the coming months and curious to see the seasons change. Two pairs of sheathbills nested on station again this summer, one in the rocks by the diesel tank and one under our trash compactor (aka The Mash and Grind), as they have done for years. 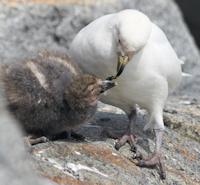 Usually, the chicks die within a few weeks of hatching. However, this year both sets of parents successfully raised their chicks to the point where they can actually fly. All season I watched them grow and rooted for them against the predatory skuas (a seagull-type bird, except very smart and long-lived) that often eat the eggs or newborn chicks. The sheathbills migrate north only a little later than the summer crew is scheduled to depart. For me, their absence will signal the end of summer and beginning of winter. Today, I will enjoy these crisp autumn skies through the window while I get started on that other slipper. (Micaela Neus works for Raytheon Polar Services Company as a utilities technician and is currently living at Palmer Station, Antarctica previously until April 2012, but as we read, she’ll be there until October, 2012 now. EAGANS DEEP COVER. Eagan deals with the many elephants in the room. Look down about 3 pages. A YOUNG AND CLEAN WILLIE NELSON. 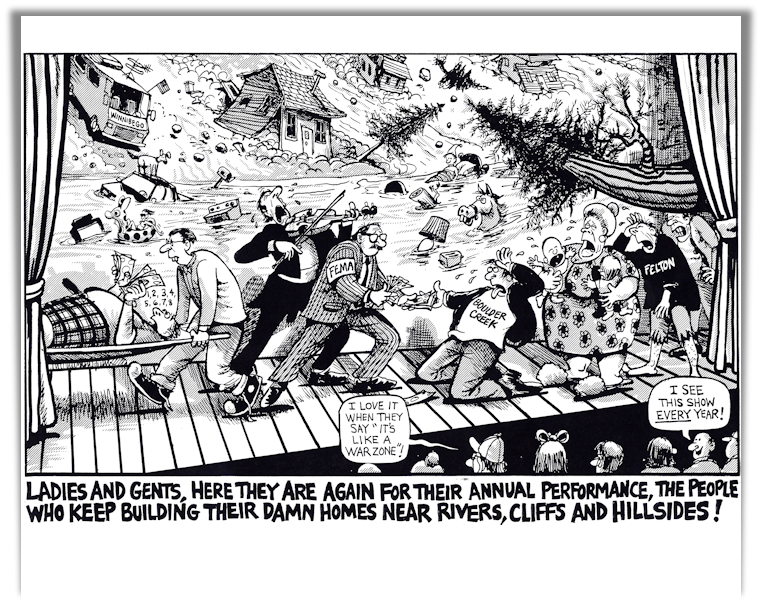 Ted Burke, of Shadowbrook and Santa Cruz Business Council fame sent this clip…truly amazing to see Willie like this. LANDAU’S PROGRES. Saul writes, “Scooter Libby vs. Bradley Manning, Malice vs. Nobility”. He says, “After 9/11, I. Lewis “Scooter” Libby, a Yale graduate with a law degree from Columbia, and fellow neo cons plotted to twist and invent “intelligence” data to convince the public that Saddam Hussein possessed weapons of mass destruction, so as to build a case for invading Iraq”.” The 24 year-old Manning faces 22 charges, including “aiding the enemy.” If convicted, the government will call for life imprisonment, unless Manning implicates Julian Assange in the “conspiracy” to expose the “secret” sins of U.S. national security. Members of the Icelandic Parliament have nominated Manning for a Nobel Peace Prize. Let’s help him win it – as a free man. LISA JENSEN LINKS. “Let’s do the Time Warp again, this week at Lisa Jensen Online Express (http://ljo-express.blogspot.com); flashback to the 1960s at the upcoming Cultural Council “Primavera” event, and take a giant leap into the future of film presentation via the recent Nickelodeon/Del Mar digital upgrade.” Lisa has been writing film reviews and columns for Good Times since 1975. JOHN CARTER. I can’t review this piece of crap. I cringed through about 30 minutes which was way too much of this absolutely worthless drivel. I’m a fan of Edgar Rice Burroughs and read many of his Tarzan books and saw almost every Tarzan movie ever made but John Carter the movie is simply insane. I even had a ticket for Eddie Murphy’s One Thousand Words but I couldn’t force myself to even enter the theatre, it looked so bad. Checking it out on Rotten Tomatoes, it’s the first film I’ve seen there that got a “zero” rating both from critics and normal people. CADENZA CHAMBER ORCHESTRA. John Orlando from Cabrilho College’s Distinguished Artists Series presents Cadenza Chamber Orchestra, Cadenza, formerly The Santa Cruz Chamber Orchestra is comprised of recognized professional musicians dedicated to providing exceptional music and education to the Santa Cruz community. They champion new compositions and have presented Two world Premieres, Six US Premieres and Three West Coast Premieres thus far. The concert features Director Maya Barsacq with piano soloist John Orlando and violinist Rebecca Jackson. Before that…Nancy Brown, MS Philosophy, moderates a Panel Discussion on the subject of “Rekindling the Spirit of the Age of Enlightenment” 11 AM. Then Don Adkins, Music Historian, will give a Preconcert Talk 7 PM. It’s all at the First Congregational Church, 900 High St., Santa Cruz Saturday, March 31. UNIVERSAL GRAPEVINE. Each and every Tuesday from 7:00-8:00 p.m. I host Universal Grapevine on KZSC 88.1 fm. or on your computer (live only, or sometimes old programs are archived…(see next paragraph) and go to WWW.KZSC.ORG. Nickolas Conrad will guest on March 13, he’s with the UCSC Secular Student Alliance and then Laura Kasa and Colleen Bednarz from Save Our Shores will talk about the Plastic Bag Stoppage happening March 20. Julie James will tell us latest plans and plays such as Hello & Goodbye and Blithe Spirit from The Jewel Theatre on March 20. After Julie, Deb McArthur from the Santa Cruz Museum of Natural History will reveal late plans and projects. On March 27 Rita Wadsworth and Shannon Marie Kerr from Mountain Community Theatre will talk about their new play, “Crimes of The Heart”. Plus John Thiemann will give us details about the Monterey Bay Funeral Society. The April 3 Grapevine has UCSC professor Amy Beal who is curating/programming the annual “April in Santa Cruz Festival of Contemporary Music”. (April 5-April 27). She’s followed by Robbie Schoen the host & director of Felix Kulpa Gallery. Mary Thyken, exec.dir. Of the Santa Cruz Community TV will be the opening guest on April 10th. Send me more program ideas if and when you have them!!! QUOTES. “Sarah Brightman couldn’t act scared on the New York Subway at four o’clock in the morning”, Joel Segal. “The play left a taste of lukewarm parsnip juice:, Alexander Woollcott. “Stephen Fry has all the wit of an unflushed toilet“, Bernard Manning.